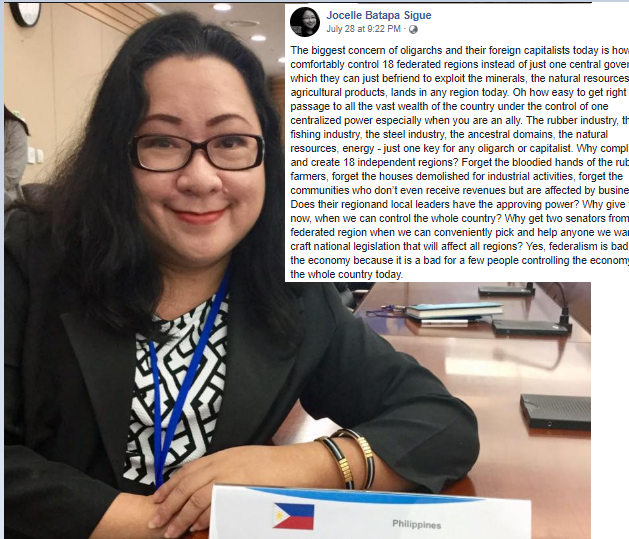 Law professor, arts and environment advocate Jocelle Batapa Sigue shared her piece about the biggest fear of the oligarchs and why they do hate federalism. Sigue, also a Mindanaoan said that once government is shifted into federalism, oligarchs and its capitalist will no longer be able to easily control the 18 federated regions. “The biggest concern of oligarchs and their foreign capitalists today is how to comfortably control 18 federated regions instead of just one central government which they can just befriend to exploit the minerals, the natural resources, the agricultural products, lands in any region today.” She said. She said, one central government can be effortlessly befriended to exploit our country’s minerals and natural resources, even agricultural part. “Oh how easy to get right of free passage to all the vast wealth of the country under the control of one centralized power especially when you are an ally. The rubber industry, the fishing industry, the steel industry, the ancestral domains, the natural resources, energy - just one key for any oligarch or capitalist.” The law professor added. The biggest concern of oligarchs and their foreign capitalists today is how to comfortably control 18 federated regions instead of just one central government which they can just befriend to exploit the minerals, the natural resources, the agricultural products, lands in any region today. Oh how easy to get right of free passage to all the vast wealth of the country under the control of one centralized power especially when you are an ally. The rubber industry, the fishing industry, the steel industry, the ancestral domains, the natural resources, energy - just one key for any oligarch or capitalist. Why complicate and create 18 independent regions? Forget the bloodied hands of the rubber farmers, forget the houses demolished for industrial activities, forget the communities who don’t even receive revenues but are affected by businesses. Does their region and local leaders have the approving power? Why give them now, when we can control the whole country? Why get two senators from each federated region when we can conveniently pick and help anyone we want to craft national legislation that will affect all regions? Yes, federalism is bad for the economy because it is a bad for a few people controlling the economy of the whole country today.